Timely warnings about on-coming disasters can literally save lives – provided the word reaches those at risk. And they know what to do, and react quickly. These elements form part of disaster risk reduction, or DRR, now receiving greater attention as the frequency and intensity of disasters keep increasing. In December 2004, the Indian Ocean tsunami caught Sri Lanka by surprise and some 40,000 lives were lost. Most of those could have been saved if only a simple warning – for coastal evacuation – reached them. There was a tight but useful window of around 90 minutes until the killer waves arrived on our East coast (and a bit longer while they went around the island and hit other coastal areas). Sri Lanka was not alone. At the time, much of the Indian Ocean was a massive ‘blind spot’ where tsunamis were concerned. There was no tsunami warning system. There was a rudimentary ocean-based seismic detector network, but it was not possible to monitor or analyze sea level changes in real time. On the delivery front, too, there was no agreed arrangement to cover the crucial ‘last mile’ to reach communities at risk. In contrast, the Pacific Ocean region has had a functional system for over 60 years. Nearly a decade on, those costly lessons have been put into practice. Much has been done to improve the science of detection as well as early warning issuing and dissemination. Today, advances in science, closer international cooperation and revamped national systems have made the Indian Ocean a safer region. This was recently highlighted by Dr Stuart Weinstein, Deputy Director of the Pacific Tsunami Warning Centre (PTWC) in Hawaii, USA. 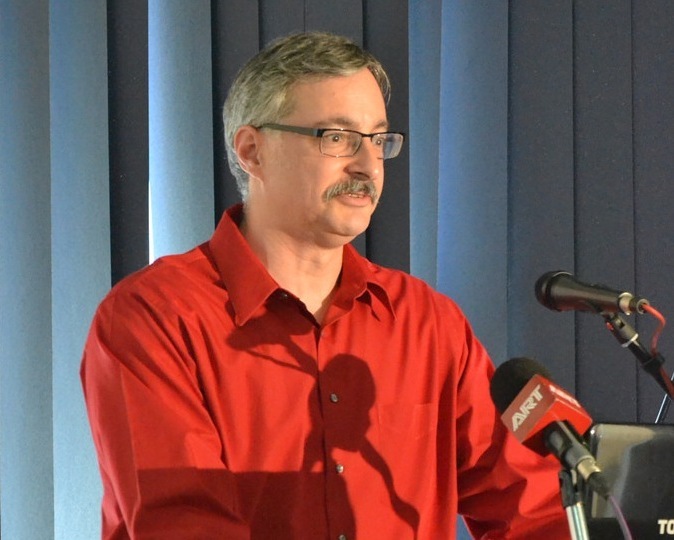 He was delivering the fourth annual LIRNEasia Disaster Risk Reduction Lecture, on ‘Advances in Tsunami Warning Systems since the Great Sumatra Earthquake of 2004’ in Colombo on 19 June 2014. Whatever the hazard, early warnings would work well when adequate technological capability combines with proper decision-making and dissemination systems, and prepared communities. In the case of tsunamis, an effective warning and mitigation system means people living in vulnerable coastal areas know how to respond when a potentially destructive tsunami may be approaching. 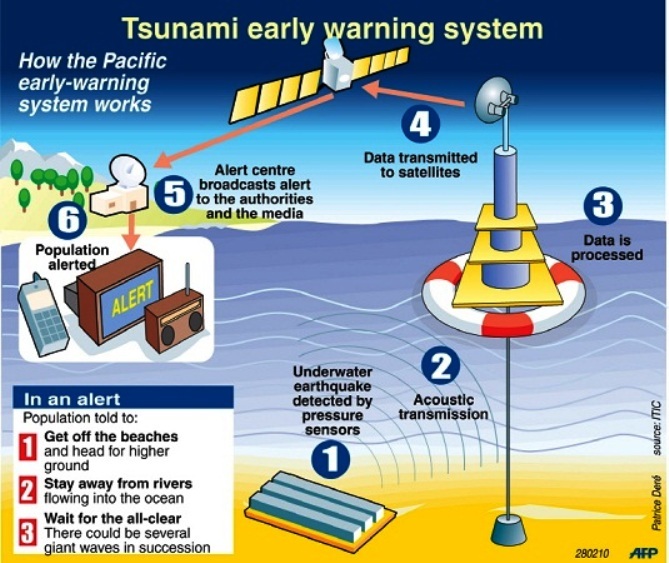 Tsunami warning systems are made up of three components. First, an international or regional arrangement (like PTWC) that detects earthquakes in real time, evaluates their tsunami-creating potential, looks for sea level changes and issues specific messages. Second, country disaster management organisations that receive such warning messages and make national or local level decisions (alert? stand-by? evacuate?). They activate communication systems and response plans already agreed upon. Third, residents in areas at risk are educated and trained. Since 2004, several regional tsunami warning systems have been set up, covering most coastlines worldwide. The Indian Ocean Tsunami Warning and Mitigation System (ICG/IOTWS) was set up in 2005 and is governed by UNESCO’s Intergovernmental Oceanographic Commission (IOC-UNESCO). The global seismic network to monitor earthquakes in real time has also expanded considerably. PTWC now receives data from over 600 stations. There is also a core sea level monitoring network in place: some 500 stations feed PTWC with real-time data. Automated sentinels – called Deep-ocean, Real-time Tsunami Reporting Systems (DARTs) — watch the world’s oceans day and night. These can detect tsunami signals immediately via pressure sensors on the ocean floor. 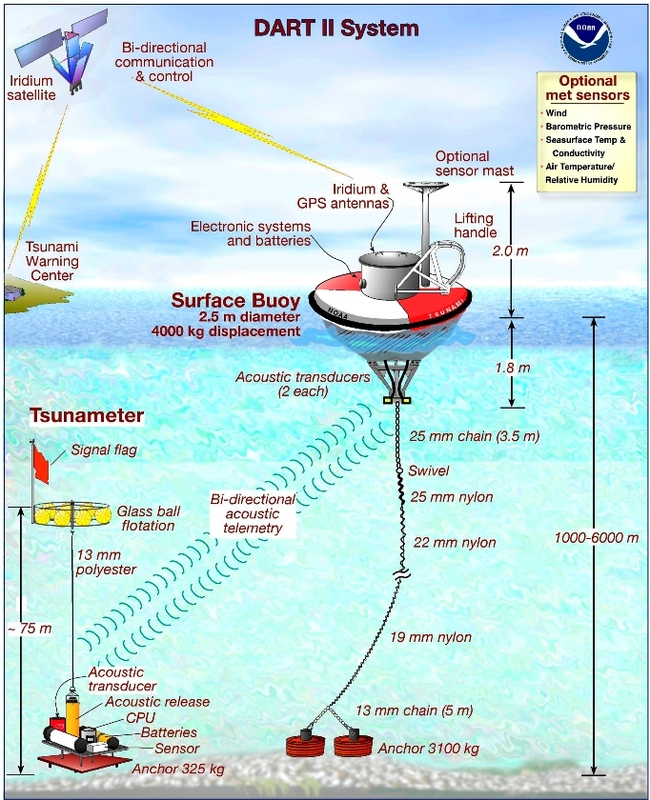 Those signals travel acoustically to surface buoys, from where they are beamed to satellites that relay them to the nearest tsunami warning centres. It then becomes a race against time. That seismic waves travel about 100 times faster than tsunami waves gives scientists a fighting chance – but only just. Effective tsunami warnings require very rapid evaluation of earthquakes and resulting sea level changes, followed by equally rapid dissemination of the assessment just made. Not every earthquake undersea generates a tsunami. Good communications is the life blood of this entire ‘relay’. It depends critically on swift communications and on global data networks with real time transmission capabilities. Disaster early warnings are global public goods: open data sharing among national agencies and cross-border collaboration between researchers is routine practice. Back in 2004, the average time for PTWC to process data rapidly and issue a warning was 18 minutes. By 2014, according to Dr Weinstein, this has been reduced to 7 mins – a tangible improvement when every second counts. Of course, even the most accurate warning is only as good as its quick and targeted dissemination. There too, progress has been made. The number and reliability of pathways to send out a warning have increased. Since 2004, the number of mobile phones in use has risen exponentially (expected to pass 7 billion active subscriptions before 2014 ends), and there is much greater signal coverage. Meanwhile, the phenomenal growth of web-based platforms and social media has opened up new opportunities for emergency communications. Using communications systems like SMS alerting, cell broadcasting, Twitter, Facebook or Google Public Alerts, tsunami warnings can be sent to a mass or niche audience. Streamlining this process is the Common Alerting Protocol (CAP), a recent global standard that allows emergency alerts and public warnings to be disseminated simultaneously over different systems and applications. By standardizing the collecting and relaying of all-hazard warnings and reports locally, nationally and regionally, CAP reduces chances for distortion and confusion. It helps to send out consistent messages on mobile phones, radio and television broadcasts, and other networks. First developed by IT and disaster management experts during 2000-2004, CAP’s first multi-lingual trials were done in Sri Lanka in the months following the Boxing Day tsunami. This was a key part of the Hazard Information dissemination action research project that LIRNEasia implemented with Sarvodaya, Dialog and other partners. In late 2007, the International Telecommunication Union (ITU), which sets standards for telecom and broadcasting industries, adopted CAP. CAP emerged just in time – when rapid expansion was taking place in TV, radio, mobile phones and Internet sectors. “The likelihood of error and distortions getting into warning messages as they pass through multiple links is that much higher now. The complexity of the first-responder system is also that much higher,” notes Prof Rohan Samarajiva, Chair of LIRNEasia. Even when the best monitoring and assessment systems are coupled with the finest dissemination methods, errors of judgement could still happen. On average, three out of every four tsunami related coastal evacuations in Hawaii later prove unnecessary. That, Dr Weinstein feels, is the “price to pay for the ones that prove correct”. His hope: the 10th anniversary of Sri Lanka’s greatest disaster will energize the efforts to build more resilient societies in the Asia Pacific. This entry was posted in Broadcasting, Communicating Development, Disaster, Disaster Communication, ICT, Indian Ocean, Media, Public information, Social Media, Sri Lanka, Telecommunications, Tsunami and tagged cell broadcasting, Common Alerting Protocol (CAP), Dialog, Disaster early warnings, Dr Rohan Samarajiva, Dr Stuart Weinstein, Facebook, global public goods, Good communications, Google Public Alerts, Indian Ocean tsunami 2004, IOC-UNESCO, LIRNEasia, LIRNEasia Disaster Risk Reduction Lecture, mobile phones, ndian Ocean Tsunami Warning and Mitigation System, Pacific Tsunami Warning Centre (PTWC), Real-time Tsunami Reporting Systems (DARTs), Sarvodaya, seismic waves, SMS alerting, The Long Last Mile, Tsunami Warning Systems, tsunami waves, Twitter. Bookmark the permalink.